Too close for comfort sometimes? A new slide-out option for Trail-lite's high-series motorhomes adds a whole new dimension to your camping experience. 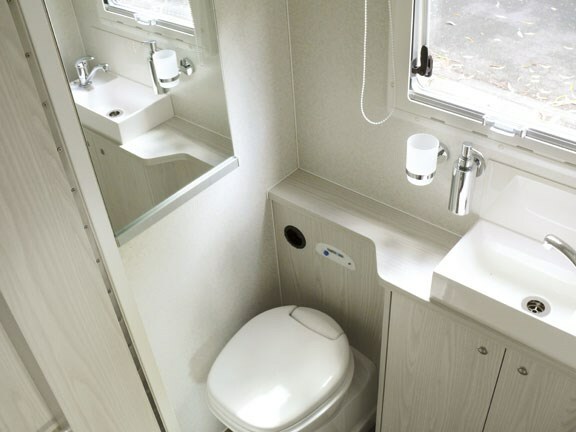 Now available as an option on a variety of Trail-lite's high-end Landmark series models, the slide-out mechanism adds static space and more of an apartment ambience, without increasing the motorhome's footprint when you're on the move. Trail-lite recently finished its first slide-out vehicle: an Isuzu-based Landmark Coromandel 800, designed to showcase the new feature to customers. The slide-out mechanism is purchased from an outside supplier, with the floors, walls and roof added by Trail-lite. The whole assembly is easily integrated into the rest of the company's modular interior design, adding an extra dimension to the seven floorplans available within the Landmark series. The lounge pictured on our test vehicle is based on the largest slide-out size, but Trail-lite also plans to source a smaller mechanism for use with more compact vehicles. 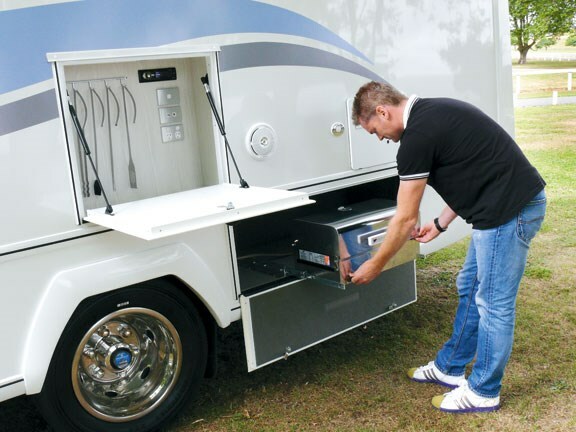 Despite adding an extra $9000 to the cost of a motorhome, Trail-lite boss Shaun Newman reckons the slide-out option will be a hugely popular one with customers. "It'll be particularly good with the larger vehicles where weight and cost are not big issues. When you're spending well over $200,000, it's not a lot extra for the space. Because it's a completely modular design, you don't have to have it. But if you do, you can decide exactly what to have. We've put a cafe lounge in this vehicle, but you could have a sofa bed that folds out, two armchairs – whatever you want, really." 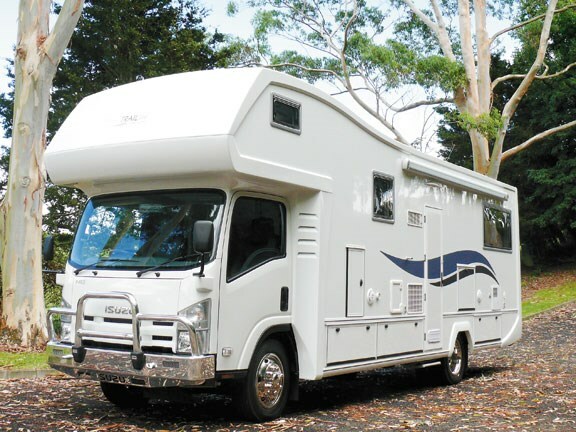 Trail-lite's Coromandel 800 display vehicle is the most expensive motorhome it has ever produced. This one totals $276,250. The kitchen features a three-way fridge freezer, a four-burner gas hob with range hood and microwave. There's also a barbeque mounted in a special compartment on the outside of the vehicle. There are two televisions on board – the main one powers up out of a recess in the lounge area, when summoned by a pushbutton. The sound system is an impressive Bose home theatre setup – with an additional stereo unit on the exterior of the vehicle. The north-south double bed is integrated above the driving compartment and accessed by stairs on either side. The full bathroom, including cassette toilet and separate shower, is right below. 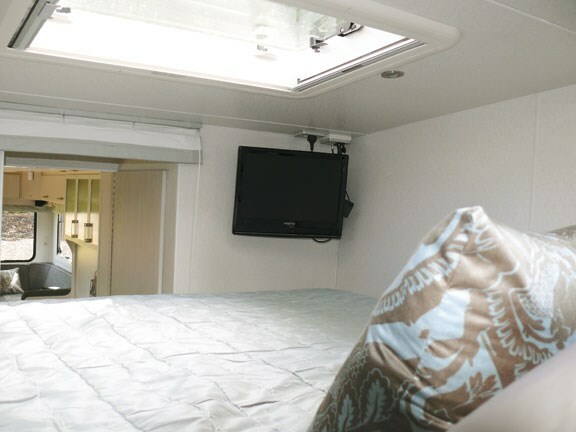 An additional pull-out double bed is provided in the main cabin. Trail-lite has also specified this model with a class-leading array of freedom camping features: 570 litres of fresh and 400 litres of grey water, an 1800W pure-sine inverter, two 85W solar panels, a 40amp three-stage charger and 520amp-hour battery capacity. 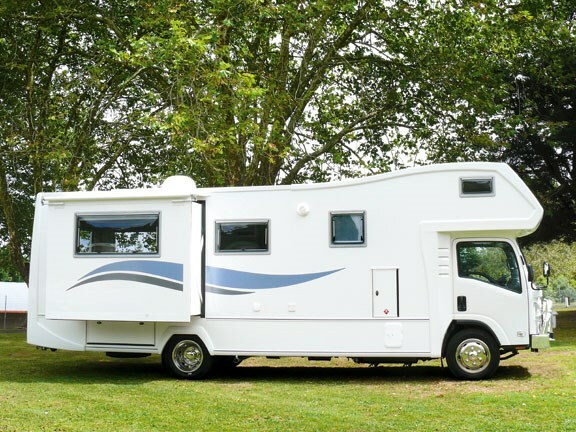 The Landmark Coromandel 800 was just one of the new products on show at the National Motorhome and Caravan Expo in Hamilton. Trail-lite's first Iveco-based motorhome was also on display. "We've just started using Iveco," says Newman. "Its advantage is that it has a high GVM and heaps of horsepower like the Japanese trucks, but it's also European-style vehicle, with a sloping nose, separate swivel seats and a walk-through from the front." The display vehicle also showcases some floorplan developments, with an island bed at the back and a lounge up front. 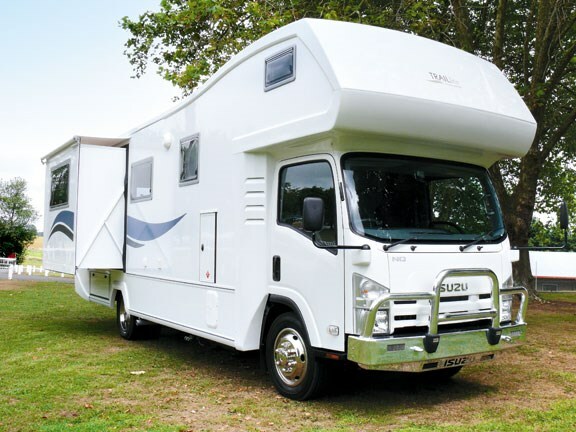 Joining the motorhomes were a brace of RoadCraft campervans – the Auckland-based company being a recent acquisition by Trail-lite. "We've always been big fans of the RoadCraft product and marketing," says Newman. "The owners, John Managh and Mary Hamilton, want to focus on the rental side of their business [called Wilderness]. So the opportunity came up to purchase the RoadCraft side of things and we took it. " RoadCraft production will shift from Auckland to Pukekohe, but beyond that there aren't too many changes planned to the range under Trail-lite. 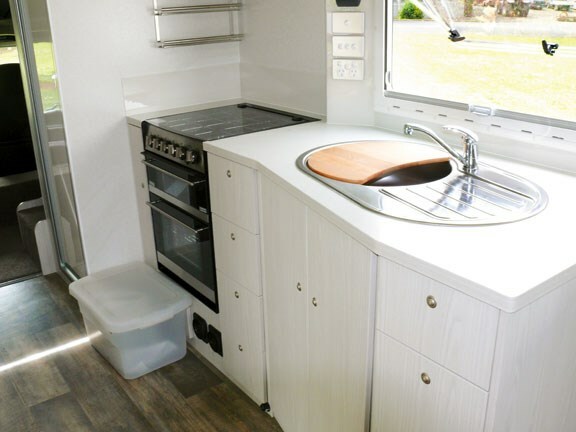 The brand is very strong in the campervan scene, using a Fiat Ducato base. 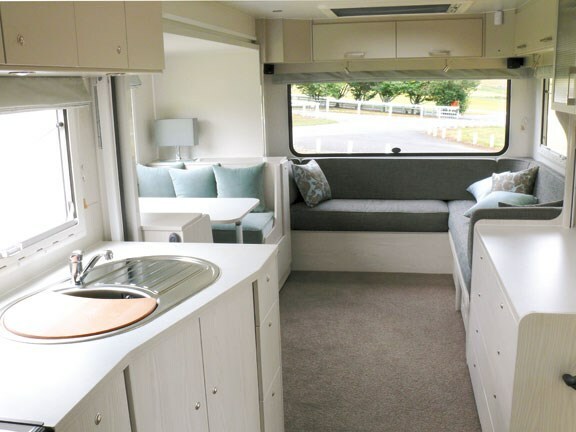 That range will complement Trail-lite's existing motorhome line up nicely: "Campervans are not something we've traditionally done," says Newman. "But like us, RoadCraft is a high-end product - about the most expensive campervan you can buy in New Zealand." People obviously see the value, because they have about 50 percent of the market. "I really love the product, the floor plans and the decor. We'll make a few little tweaks, but just to bring the vans into line with the rest of our range." And finally, Trail-lite has also come full-circle and returned to its roots – by launching a caravan. Which is how it got started, back in 1954. But there will be nothing old-fashioned about Trail-lite's 2010 offerings, says Newman. 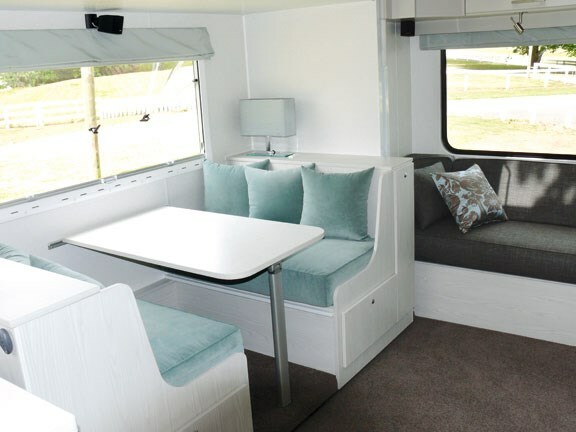 "Caravans tend to be quite traditional, but we're going for a more modern look with our new one. It won't be cheap, but it will look sharp on the outside and be unlike anything else on the inside." The upmarket look and feel of the Trail-lite Landmark motorhome justifies the price. 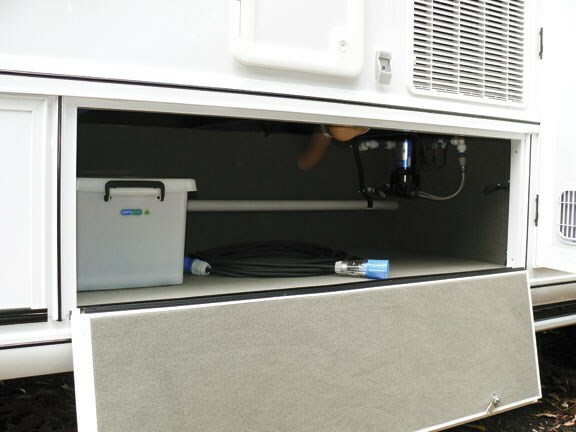 It's hard to argue with the quality and construction, and Trail-lite's ability to provide a high level of customisation for its Landmark customers is impressive. Love the decor, too – Trail-lite has its own interior designer, Victoria Scott, who works with customers on a one-to-one build basis. It shows.